Plenty of crumpet on Loi Kroh Road. Sorry, couldn't resist. Now this is what we are talking about, and if you have eaten these then just looking at the picture and you will be able to smell them. My wife came to England last summer, she loved them with Cheshire cheese grilled on top, and soaked in butter, of course. And american 'lodge' cast iron skillets are sold in villa market, not so expensive....1000 or so iirc.. If the rings stick you need teflon coated ones, they probably have those as well in central or so. Villa market sell Warburton Frozen crumpets from UK in a pack of 6 for 105 Bht at Sukhumvit 33.. Not cheap..
3 flips in the toaster, nice and crunchy with decent marg/butter and honey. Once thawed use within 4 days..
Not as good as Golden crumpets from OZ but still good.. I wish. Villa in Pattaya sell an unknown brand for 210 baht for a pack of 6 small crumpets and they are awful. Warburtons are the best crumpets, anywhere. Are you OK? 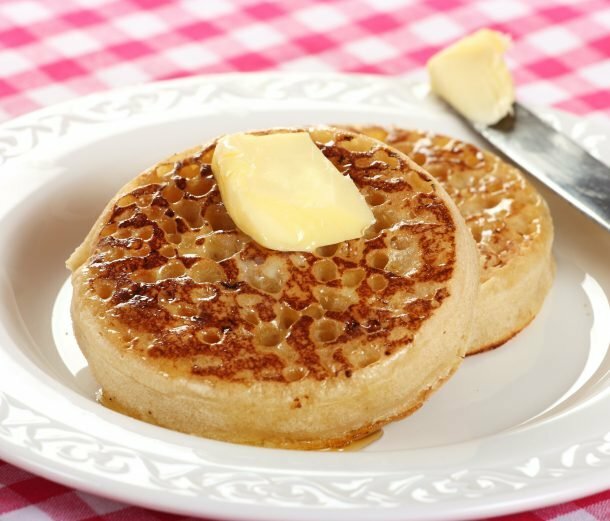 Have you ever tried to make crumpets in Thailand? Do you know how much a cast iron skillet costs? Do you know how difficult it is to get even heating with a gas hob? Who is going to clean up all that batter mess? And getting the batter out of the egg rings? Do you know where to get good flour in a small Thai town? How do you get the gas on a low setting? There are no low setting gas hobs in Thailand! Have you ever been to Thailand? You can buy them here in Hua Hin. As far as making your own, they're so easy. Baking soda is readily available. Yeast is readily available. Once you have made the 'batter' and allowed a few hours for it to double, then they're so easy to make. Once made, you can freeze them. As good as any from Warburton's. OK smart guy. Send a photo of your crumpets. I make sourdough pizza dough and bake in my pizza oven weekly and bread every other day. Crumpets are a mess. I learned how to make crumpets at the Pike Place Crumpet shop. The egg rings are sharp and easy to cut fingers with. To get a low heat I have to support the griddle above the hob. I refuse to buy a cast iron skillet for only one use - crumpets. I think perhaps you have a less discerning palate than I for crumpets and are satisfied with a poor quality product. I buy mine at tops and foodland. Other problems, surface has to be the correct temp when pouring batter, rings have to be cut with something while hot, metal spatula shoved under crumpet in confined area, do you finish in oven? Another step. All in all complicated and time consuming and difficult to make and clean up with a yeast batter. It is not like I haven't tried. I really like crumpets and so does my wife. Crumpets rank right up there with souffle's for things I find difficult to make. And don't forget this; never clean up dough mess with warm or hot water. Guess everyone (doesn't) know that. Do you chill your Thai water before using it to clean? Is tap water cool in Thailand? What gas setting do you cook the crumpets on? I wonder if one can create crumpet in a microwave? - some sort of u'wave heat conductive plate?? The other thing I may have done that created problems was use a sour dough starter because I like sourdough crumpets. But that aside perhaps someone could explain to me what this means in English. 5. For the butter, pour the cream into a freestanding mixer. Whisk on high for 5 to 10 minutes, or until the cream splits into solids and liquid. 6. Drain through a sieve, discard the liquid, then rinse the solids thoroughly with cold water. Place in muslin and squeeze out any excess liquid. Mix ½ a teaspoon of sea salt through and wrap in greaseproof paper.